The lithograph of Fr. Andresito holding his favorite image of his beloved Saint Philomena. January 10th is the day that marks the birth of a very special devotee of Saint Philomena from South America, affectionately called “The Begger Saint”, AndrÉs García Acosta, better known as Fray Andresito. 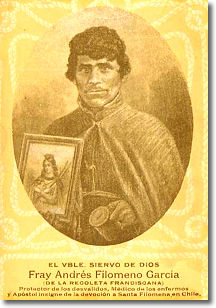 Fray Andresito was born on the 10th of January in the year 1800. Fray Andresito became widely known in Chile for his tireless spreading of the devotion to Saint Philomena and was admired for being a pioneer of the social action in his country. He was dedicated to working the streets of Santiago, offering charity where needed, preaching the Gospel, and becoming a saint of the workers. 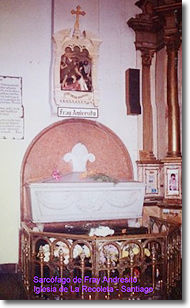 Devotion to him became widespread after his body was discovered incorrupt two years following death, which resulted in his cause being put to canonization. His body was exposed for three days for public veneration at the foot of the consecrated altar to Santa Filomena in the church of the Recoleta Franciscans. On the day of his death, the newspaper "El Progreso" reported, "...his Evangelic charity had gained him such popularity that we may say there must be no person in Santiago who didn't know him. Santiago's poor have lost a great support and the comfort for their disgrace…". The publication, "El Mercurio" wrote, "The fame of his virtues, the sane doctrine his lips poured out, the Christian consolation with which he calmed the soul's sufferings, the sublime charity with which he assisted the poor in their sickness, gave him the popularity he had in life and the status of Saint with which the people identified him...". Because hundreds of readers from all social classes requested a portrait of the friar, a lithograph was made for sale at the paper's agency. Fr. Andresito continued to be written about throughout the nineteenth century. 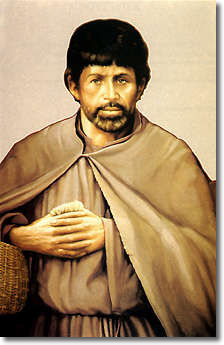 He became known as "charity's apostle", "endless goodness apostle", "religious saint", etc. In the latter part of the century, he began to receive international recognition and in 1893, steps were taken to begin his cause for beatification. The twentieth century saw a profusion of writings about his life. Many people visited his grave and more endearing names were given to him..."the humble Franciscan", "the pioneer of workers' movement", "protector of the weak" and "doctor for the sick". In 1927, Fr. Bernardo Tasch founded the Sisterhood of Fr. AndrÉs, which spread throughout Chile. Fifty years later, Fr. Jaime Calderón founded the society, Friends of Fr. Andresito. There were published lists of hundreds of devoted from Chile and abroad. To this day, he is still revered by fellow Franciscans across the globe and his memory lives strong in the hearts of South Americans as a shining example of a Holy Soul dedicated to the Glory of the Name of God.